While search engine users are accustomed to getting objective results on search engine results pages (SERPs), Google now serves up “subjective” results as well. When logged into Google and with personalized search turned on, you will see SERPs that include results based on your Web browsing history, as well as content authored or endorsed by your social connections. Notice that the first two rows of images are completely different. 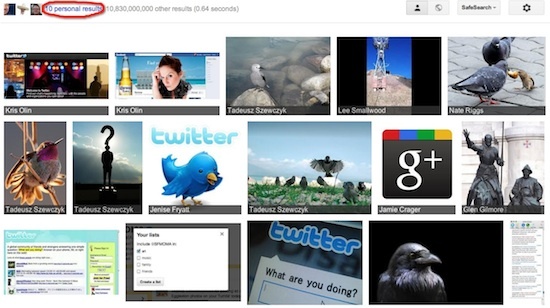 At the top of my personalized search, I see 10 images associated with my Google+ connections. With personalized search turned on, I also have the option to view only my personal results. Creators become visible to their direct connections. Content associated with a particular creator will get top position in personalized searches conducted by people who have circled them. Imagine what would happen if a creator tripled the number of circles they were in, or if Google began to incorporate Twitter and Pinterest follows into its personalized search results. Creators become visible to their indirect connections. If a creator’s content is endorsed by someone in the Google+ network, the content could appear in the personalized results of searches conducted by that person’s connections. The ripple effect can extend a considerable distance. Creators become visible to people who visit their website. If someone frequents a creator’s website, Google will serve that creator’s content in their personalized searches. The trend: As time goes on, expect Google to get smarter about how it ranks personalized content, and for Google to cast a wider net across social networks to retrieve it. Quick tip for creatives: Strengthen and broaden your social connections to give your work more exposure on search engines. Keep looking for better ways to bring new visitors to your website, and to keep them coming back. One factor that Google considers in evaluating a page of content is its social shares. Google sees likes, +1s, tweets and other types of shares as indicators of content quality and trustworthiness. This is reasonable enough: a blog post with 1500 retweets has more clearly established value than a comparable post with five. Social sharing is more important than ever. At the moment, how much value Google accords to social shares is still unclear, which is fair enough because many questions remain unanswered. Is a tweet more or less valuable than a like? How do you evaluate the authority of the person doing the sharing? How are people gaming the system to inflate the number of shares? Nevertheless, we should expect social sharing to grow in importance for SEO. First, there is demand: people would love to consider social endorsements for certain types of searches, provided they have confidence in the data. Secondly, there is self-interest: Google is committed to its social network, Google+, and isn’t about to ignore it on its own search engine. The trend: Social sharing now has its biggest impact on standard search results. Expect Google to ratchet up the presence of share-influenced links in personalized results as well. For instance, we could start to see a variety of segmented search options that display content shared by a defined subset of your connections. Quick tip for creatives: Make social-sharing buttons prominent to make it easy for people to share content on your website; actively engage in social media; and publish your content on websites where content is widely shared. 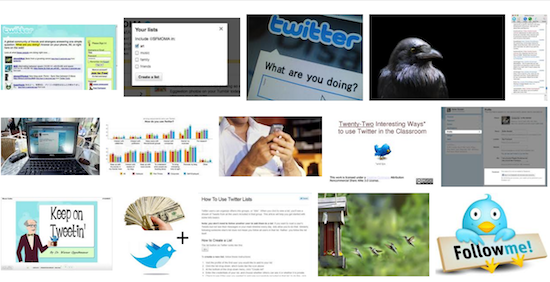 In the old days, there weren’t too many ways to slice and dice search results. Today, there are scores. Tomorrow, there will be hundreds. Multiple search options create opportunities. Note, too, that segmented search offers a “personalized” option, where, again, users can zero in on content based on their browsing history and social connections. The trend: Google will continue to categorize content to help users drill down to search results that are precisely relevant to their intent, rather than broadly relevant to their keywords. In particular, segmented search options for images and video will become much more sophisticated, in response to our insatiable appetite for visual content. Quick tip for creatives: Stay current on how Google segments content, and shape yours to stand out in segments that are natural homes for your work. For years, creatives have complained that “black hat” SEO tactics pollute rankings, pushing high-quality content down the page. However, as Google’s algorithm grows more sophisticated, it gets better at combatting black-hat practices — more great news for content producers. Google is sending clearer SEO signals. Google fights content spam by emphasizing quality in its algorithm and by being transparent in how quality is calculated. Quality has always been a focus; the current level of transparency is something new. Google’s Panda update, released in 2011, was a declaration of war against content manipulators. A primary goal of this algorithm change — and of many that followed — was to decisively penalize worthless content and to reward highly relevant, meaningful and trustworthy content. In addition to the algorithmic measures, Google is taking the smoke and mirrors out of search by more openly communicating algorithm changes to SEOs and the general public. Why? In some cases, black-hat tactics were inadvertent, caused by website administrators using outdated techniques or misinterpreting Google’s algorithmic intent. Furthermore, a good deal of high-quality content gets lost in the search shuffle because creators simply ignore SEO. More than ever, Google wants every website to be optimized and optimized properly. The more high-caliber content Google can serve up to users in SERPs, the more business it will do. The trend: Google will push hard in this direction, devising more accurate methods of evaluating the relevance, substance and trustworthiness of content. It will get better at interpreting both the inherent quality of the work itself and the social-sharing data associated with it. Google enthusiasts see the Google+ social network as the greatest thing since sliced bread. Most everybody else thinks Google+ is less useful for marketing than sliced bread. But whether or not you like Google+, the network cannot be ignored for SEO. Content creators ought to take note of two particular aspects of the network. The rel=author link builds a creator’s brand and search visibility. First, Google+ content gets indexed and ranked. In fact, when you publish original content on Google+, not only is it indexed and ranked, but it is given prime positioning in personalized SERPs. Images and video that are stored on Google or associated with personal pages on Google+ also receive greater exposure in search, as demonstrated earlier in the screen captures for image search. Secondly, the rel=author link associates a page of Web content with its author’s personal Google+ profile. This is a technical mouthful, but it’s a big deal for creatives. 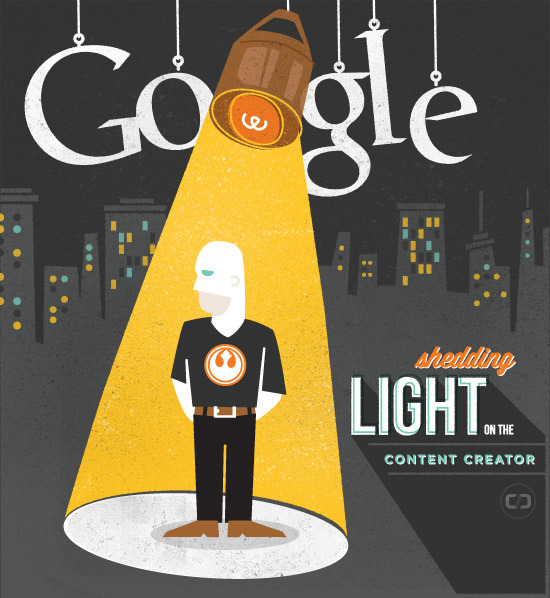 Google has begun to link content to its creators as well as its publishers. “Authorship markup,” or “author rank,” is being developed at a furious rate because people sometimes want the option of searching for content by a particular creator or want results ranked according to the authority or expertise of the creators. The trend: High-authority creators will see their content become more visible in search results, and for that reason, publishers will need to seek out high-authority creators to boost traffic to their websites. Given these recent developments, let’s look at how authors can manage their content to increase its visibility and obtain all of the benefits that go along with that. Some of the following suggestions are technical in nature, while others are creative techniques that are not always thought of as aspects of SEO. However, with Google getting better at evaluating the quality of content, people are now less able to inflate the ranking of inferior content through technical manipulation and must instead treat the quality of their content itself as the linchpin of their SEO program. Give users an incentive to share. Here’s a basic outline of how to set up rel=author links for your content. Google has a more thorough rundown. In the byline of any content that you create, set the anchor text to be your name as it appears in your Google+ profile, and link to your profile with a URL that looks like this: https://plus.google.com/102318046680468697385?rel=author. 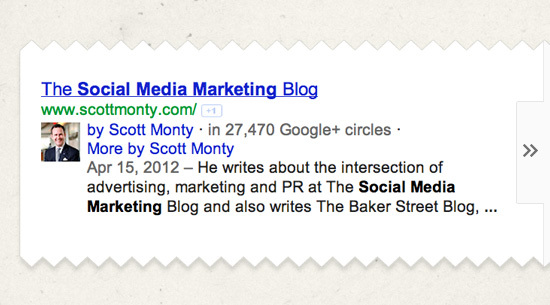 When your content is published, link back to its URL from the “Contributor to” section of your Google+ profile. Once your content is indexed, your Google+ profile picture and name, along with the publication date, title and description, will (sometimes) appear in SERPs, in both standard and personalized results. This gives you more exposure, and it instills trust in users that the content has a human author, and that the author is reputable. This adds up to higher ranking and more people clicking through to your content. Please note: Author attribution is still in the early stages of development. Google frequently changes both the procedures for setting up links and the presentation of author information in SERPs. The instructional link above should be up to date whenever you are ready to dive in. Guest blog posts. Set up a rel=author link somewhere in your content. The most sensible place to do this is either in the byline or in the bio area. If the blog doesn’t accommodate such placement, then a rel=author link in the body of the post would work, too. Infographics. If you create an infographic, add a blurb below the image saying, “Infographic by [your name],” with a rel=author link. Video. Follow the same procedure as described above for infographics. Dual authorship. What if an article is coauthored or the author wants to credit a photographer? The best practice is to use only one rel=author link per page. If more than one link appears on a page, the first that appears in the markup will be the one whose name and image are featured in SERPs. Incorporate the rel=author link into the byline of every post in your archive. This establishes you as the author and gives all of your existing content an SEO boost. Several WordPress plugins are available to automatically set up the links for single- and multi-author blogs. If you are using another CMS, check with the developer to see whether and how it supports rel=author linking. Ramp up guest blogging efforts.. Getting published on highly authoritative, highly shared blogs has always been useful, and adding the rel=author link to your guest posts delivers even more value. Blog directly on Google+.. 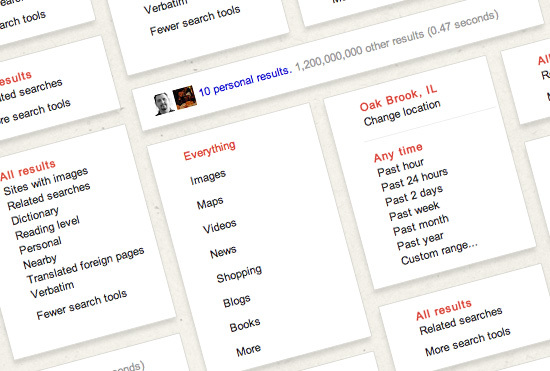 Earlier, we mentioned that Google indexes and ranks original Google+ posts. To take advantage of this, some “plussers” are actually writing lengthy original posts on the network. This strategy could be well worth testing, especially if you already have an active presence on the network. And it could work particularly well for photographers, designers and videographers, who can surround their visual content with keyword-optimized text. Let’s consider an example of creating targeted content to capitalize on Google’s segmented search. If you wrote a post about social media marketing at an advanced reading level, Google would probably rank it very low in its fully aggregated SERPs. Because the vast majority of content (82%) is written at an intermediate level, Google assumes that is what searchers are looking for. However, for segmented searches, it’s a different story. Writing an advanced article would probably make you highly visible to people drilling down to that reading level. And even though it’s a small group (2%), it could include people with a lot of interest and ready to take action. Another possibility is to write a basic article about social media marketing. Here again, there is less search competition (16%), and there is a good chance that people who are new to social media will want to drill down to basic articles. Google does not clearly explain how it defines these three reading levels. But its model, according to Google’s Daniel M. Russell, is based primarily on input from teachers who have classified various pages of text. You can read more about Google’s reading level model on Russell’s personal blog. At one time, SEO was a fairly straightforward exercise in shaping content on a particular domain to rank highly on basically one flavor of SERPs for a given set of queries. But as we’ve seen, Google now considers who created the content in addition to where the content lives, and query options have expanded thanks to the segmentation of search options. On top of all this, personalized search options enable users to view results based on the online behavior of themselves and their social media connections. While technical expertise still matters tremendously in SEO, authorship is gaining ground, and quickly. Google is attempting to cut out the SEO middleman and make search a matter of directly connecting great content creators (as defined by the inherent quality of their work and their popularity) with searchers who will find great value in their content. This explains why Google is being more forthcoming about its algorithm: the maneuver levels the technical playing field and forces SEO practitioners to differentiate themselves through the content itself. What more could content creators ask for? Below are resources containing detailed information on content-related SEO techniques that should be of interest to creatives who market themselves and their work. “Author Information in Search Results,” Google Webmaster Tools Instructions on setting up rel=author links. “Google Evaluates Reading Level?! 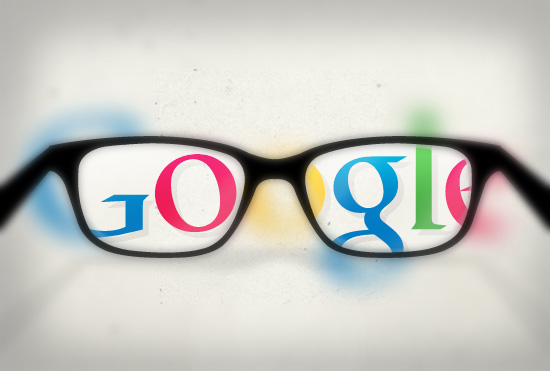 ?,” Pure Visibility How Google evaluates reading levels and why it matters to writers. “Webmaster Guidelines: Quality Guidelines,” Google Webmaster Tools Best practices for content quality. “Search by Image,” Google How image search works. Note: All images used for this post have exclusively been created by Straight North.